I was dreaming of kaffir lime leaves the other day and then lo and behold there they were right in front of me at the super market. It was a signal. I came home and went recipe hunting. As you can tell from the number of curry recipes in my recipe index curry is one of my number one favourite foods right behind French Fries! This recipe is Thai inspired and has chickpeas, roasted butternut squash and spinach. The kaffir leaves give it a fresh Thai flavour and the bonus is that it’s super easy to make. I found this recipe on trinitykitchen.com. Give it a visit as she has come great recipes on it. Peel, de-seed and dice the butternut squash into chunks of about 1.5cm (or ½ an inch) cubed. Larger chunks are fine, although you’ll need to add extra baking time. Place the squash onto a baking tray and pop into an oven heated to gas mark 7 (425F/220C). Bake until you can pierce a fork through the chunks. This make take 30 – 45 minutes. Whilst the squash is baking make the rest of the curry. Place the kaffir lime leaves and 350ml of water into a medium sized pan and bring to the boil. (Note: Count the kaffir lime leaves as you put them in and remember how many you used, because you will have to remove them at the end of the cooking period. They are meant for flavour, rather than eating). Take the seeds out of the cardamom pods and crush with a pestle and mortar (or alternatively chop repeatedly over and over with a sharp heavy knife until they look ground). Toss them into the pan. Peel and grate a heaped teaspoon worth of fresh ginger. Toss it into the pan. Peel and crush 4 large garlic cloves and add to the pan. Add the sea salt, coriander, turmeric, black pepper, passata, creamed coconut and chickpeas to the pan, stir together and allow all of the flavours to infuse. Let this simmer on the lowest heat for about 20 minutes and turn off the heat. Once the squash has baked, take the kaffir lime leaves out of your other pan. When you are happy that all of the lime leave are out, then roughly chop the spinach and mix in the curry pan along with the roasted squash. Add a little extra water if the sauce is too thick. Use the basil to garnish. Serve with rice, quinoa or millet or on it’s own as a stew. Thanks Trinity for this awesome recipe. My sister and niece came for dinner the other day and I wanted something vegan AND delicious. I know they both love curry so this was a great find. I’ve checked out numerous recipes but picked this one mainly because it’s chock-a-block full of veggies, and it was simple. I loved that you could add yogurt to the recipe as well which I did for the vegetarians in the group. I’m not a picture taker but trust me this was fantastic. I’m a fan and would easily make this again. I got this via The Endless Meal which just so happens to based out of Vancouver which is where I’m located. Add the potatoes to a medium-sized pot, cover with water and bring to a boil. Let the potatoes boil for 5 minutes then add the rest of the veggies to the pot. Let them boil for another 5 minutes then drain the pot and set it aside. 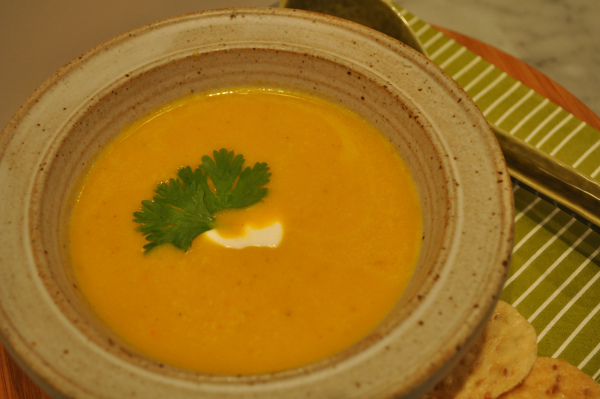 While the veggies are cooking, start preparing the vegetarian korma sauce. Heat the oil in a medium-sized pot over medium-high heat. Add the onion and cook, stirring occasionally, until it is soft, about 5 minutes. Add the ginger and garlic and cook for 2 minutes more. Remove the pot from the heat and add the tomato paste and all of the spices. Stir well then return the pot to the heat. When the spices are fragrant and the tomato paste caramelized, after about 1 minute, add the coconut milk, cashews, lemon juice and 1 1/4 cups of water. Let the pot boil for 5 minutes to soften the cashews. Working in batches, blend the curry until it is smooth then add it back to the pot. Stir through the yogurt and brown sugar and add more sea salt, if needed. Stir the veggies into the curry and serve immediately topped with any or all of the toppings. Hey Veg Heads! It seemed very sad to me that I couldn’t eat pho because of its porky broth. Well, guess what? There is a fantastic pho recipe that I made recently. It caught my eye on Vegetarian Times and it’s as good as gold. 1. To make Broth: Place all ingredients in large pot with 8 cups water. Cover, and bring to a boil. Reduce heat to medium-low, and simmer, covered, 1 hour. Strain broth, and return to pot. Discard solids. 2. To make Pho: Cook rice noodles according to package directions. Drain, and rinse under cold water. Divide among 6 large soup bowls. Ladle Broth over noodles, and top with tofu, sprouts, watercress, and green onions. Serve cilantro, basil, and lime wedges on the side to be stirred into soup. I made a vegetarian version of Jamie Oliver’s Asian Chicken and Tofu Noodle soup and it was fantastic. It was easy to make and it is now competing with laksa, my other favourite rice noodle soup. For those of you interested in the original chicken version here is the recipe. Peel and finely slice the shallot, ginger and garlic. Heat the peanut oil in a large saucepan over a medium–low heat, then add the shallot, ginger and garlic. Fry for 5 minutes, or until softened. Add sesame oil and fry for a few more minutes. Add star anise and cover with 1 litre of bouillon. Gently bring to a boil, then reduce heat to low and cover the pan with a lid. Add mushroom and prawns. Add a dash of soy sauce to taste. Simmer for 10 minutes. Add spinach to heated broth before you’re ready to serve. Pick the herb leaves, chop the tofu into ½ inch (1.25-centimetre) cubes. Cook rice noodles. Place rice noodles in serving bowls, add herbs and tofu and then ladle broth with spinach, prawns and mushrooms and serve. I gave everyone a small ramekin with hot pepper, a slice of lime and herbs and green onions so they could garnish their soup to taste. A big bottle of sriracha was on the table ready and waiting. Serve and sigh with satisfaction. So easy, so delicious. Thanks Jamie Oliver! My friend Bonnie and her sister are the beauty and the brains behind Shiny Tomato recipes. Visiting their web site is almost as good as being in Bonnie’s house which has this fantastic, warm, fuzzy, Mad Men feel to it. So much so you almost never want to leave especially after having one or more of her delicious cocktails:) Last year she hosted a cheese fondue extravaganza – be still my beating heart. Cheese fondue, you say? But this post isn’t about cheese fondue. This is about a fabulous Carrot Lemongrass Soup she posted which I tried and which I can now attest to its amaze-a-ball-ness (a word borrowed from Pearlie which I am now going to own). Heat the stock while you prepare the soup ingredients. Add the lime leaves & keep warm. Prepare the lemongrass by cutting the stalk 4” from the root end. Get rid of the top and peel the outer layer from the bottom piece. Using a broad bladed knife, smash the lemongrass. Mince & set aside. Heat oil in a soup pot over medium heat. Add onion & 1 tsp salt. Cook onions until translucent. Add minced garlic, ginger, lemongrass, curry paste & coriander; sauté & stir for 5 minutes. Stir in the chopped carrots & remaining salt (2 tsps). Sauté for several minutes, then pour in hot stock. Bring to a boil & simmer until the carrots are soft (about 15 min). Remove lime leaves & puree with hand blender/food processor until smooth. Whisk in coconut milk, sambal oelek &simmer gently for 15 minutes. Just before serving, add lime zest, juice & season to taste with salt or more sambal. Garnish each bowl with freshly chopped cilantro leaves & a spoonful of yogurt. My friend Janet posted this recipe so I tested it right away and wow, it was fantastic. The spices come together to give this simple vegetarian dish a complex beautiful taste. If you don’t already stock the usual array of Indian spices it’s worth going out and getting them including the more unusual ones required in this recipe. The original recipe comes from the Guardian web site and was shared by Yotam Ottolenghi. So thanks Yotam! Amazing veggie treat. This chill breaker is the ultimate antidote to any seasonal malady; I could eat mountains of it. Serve as a thick soup, or alongside plain rice or roti. Serves two to four. Wash the lentils in plenty of water, drain and soak in 350ml of fresh water for 30 minutes. Cut the coriander bunch somewhere around its centre to get a leafy top half and a stem/root bottom half. Roughly chop the leaves. Put the stem half in the bowl of a food processor, add the onion, ginger, garlic and chilli – all roughly broken – and pulse a few times to chop up without turning into a paste. Put the mustard seeds in a heavy-based pot and place over medium heat. When they begin to pop, add the onion mix and sunflower oil, stir and cook on low heat for 10 minutes. Add the spices and curry leaves, and continue cooking and stirring for five minutes longer. Now add the lentils and their soaking water, the tomatoes, sugar, fenugreek, asafoetida and a pinch of salt. Cover and simmer for about 30 minutes, until the lentils are fully cooked. Before serving, whisk together the yogurt, cucumber, oil and some salt. Stir into the lentils the butter, lime juice and chopped coriander leaves, taste and season generously with salt. Divide into bowls, spoon yogurt on top and garnish with coriander. Curry lovers, this is delicious. The buttermilk gives it a slightly tangy flavour but if you love mushrooms and if you love curry this is the meal for you. Boil peeled potatoes and set aside. Roughly break up the potatoes so there are still fairly large pieces…not too big and not too small! In a large heavy-bottomed pot, heat oil on medium high for 45 seconds. Add cumin seeds and allow them to sizzle for 30 seconds. Add garlic and saute for 1 to 2 minutes, or until golden. Stir in ginger and sauté for 30 seconds, then add salt, coriander, cayenne and turmeric and sauté for 1 minute. Reduce the heat to low, stir in potatoes and mix well. Increase the heat to medium high, add water and stir thoroughly. Bring to a boil and reduce to low. Pour buttermilk into a large bowl. To prevent the buttermilk from separating in the soup, use a ladle to spoon about 11/2 cups of the hot potato curry into the buttermilk. Whisk the mixture until it is well combined. Carefully spoon all of the buttermilk into the pot of curry. using the whisk, mix well and stirring continuously, bring to a boil on low heat. Add mushrooms and cook for 2 minutes, or until slightly wilted. Remove from heat and serve. Notes: I wanted to make this for 2 people so I used only 3 potatoes and half the water. I also substituted yogurt for buttermilk and it was still delicious. I served this with rice, poached salmon in curry coconut sauce and beet greens sautéed in ginger, lemon and cumin. This recipe is from Vij’s, At Home, Relax, Honey .This is a great cookbook full of helpful tips as well as vegetarian, meat and seafood recipes.